Bridgeport has always been home to a tight-knit community of families and, of course, White Sox fans. The South Side neighborhood sits right off the intersection of Interstates 55 and 90, just south of Chinatown and Pilsen. Until recently, the neighborhood flew under the radar, remaining a best-kept secret among residents. That all changed this past summer, when Bridgeport was named a “hipster haven” neighborhood in Chicago by tourism group Choose Chicago. 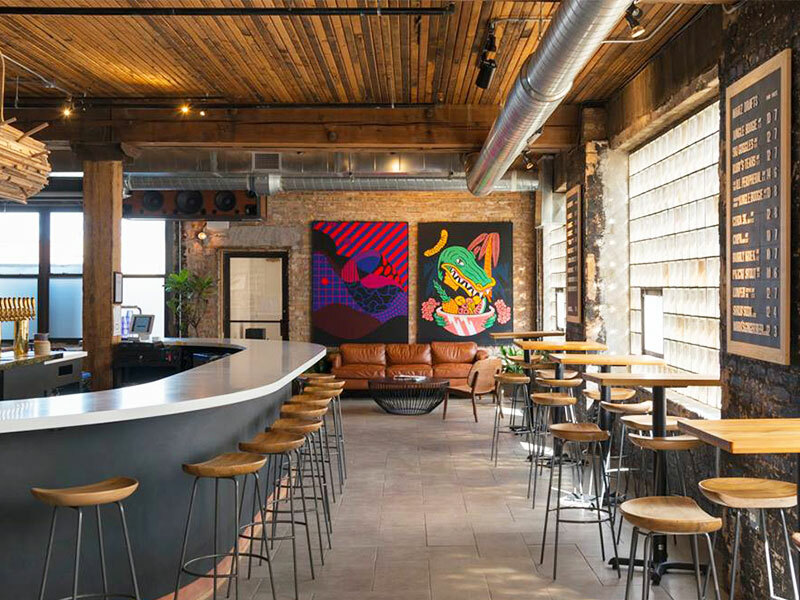 Ranked right below expected entries Wicker Park and Logan Square, this quiet neighborhood has become a hub for artists, foodies, and all creative types. But really, its appeal is not entirely new. According to DNA Info, the community has been dubbed an “up-and-coming neighborhood” before. WBEZ talked about it back in 2009 and the Boston Globe deemed it the next hot neighborhood in 2014. While the rents haven’t soared as much as Wicker Park and Logan Square and development surely hasn’t hit a peak like it has on the northwest side of the city, Bridgeport is still a lowkey neighborhood for creative types. Most recently, the food scene is getting its share of the spotlight, a surefire sign of a growing community. Originally founded in 2013, Marz Community Brewing opened its taproom at the end of February to much fanfare. The taproom opened in a space above the production brewery in a four-story building less than 10 minutes away from Guaranteed Rate Field, where the White Sox play home games. The team behind Marz has already made its mark on the community with Maria’s Packaged Foods, a bar and craft beer store that recently opened up the Polish-Korean eatery Kimski. Brewery founder and Maria’s co-owner Ed Marszewski is also one of the people behind Lumpen magazine and radio. The space is part brewery, part eatery, and part art gallery. The art in the brewery will rotate seasonally and art prints will be for sale. In addition to the beers on tap, there will be kombucha, seltzer, and coffee. The menu will be curated by Tony Balestreri, the man behind Kimski, and feature standard pub fare with a twist. The fare in Bridgeport is certainly indicative of its culture, but the area is seeing more and more of its neighboring communities start to share in the experience. A Place by Damao was created by 24-year-old Aishan “Damao” Zhong and Mori Guo, who are making waves by blurring the lines between Chinatown and Bridgeport. By bringing the tradition of Chinatown cuisine and pairing it with the youthfulness and creativity of Bridgeport, restaurants like A Place by Damao are really changing the game on the South Side. The restaurant is, in essence, elevated street food. Zhong told Fooditor that her inspiration for the eatery came from street food carts in Chengdu in Sichuan Province, China. It’s a small storefront with a dining room that can seat about 20. Zhong wanted to bring authentic Chinese cuisine to Chicago in a different way. She told the publication that she wants Americans to know that there are many different kinds of Chinese foods, and at Damao’s there’s a big focus on Chengdu food. While new and adventurous eateries are opening up in Bridgeport, there are still the fan favorites that have been in the community for a while. 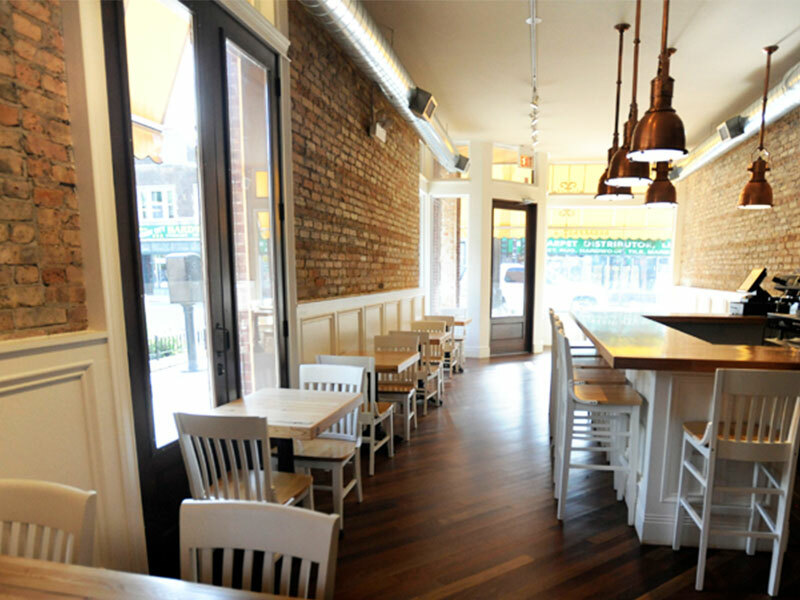 Nana, in particular, is a family-owned, eco-friendly, and locally sourced restaurant on Halsted Street. Nana has a network of 30 farm partners and makes smoked meats, pastries, and preserves in-house. Nana made the 2018 Michelin Bib Gourmand Guide for the seventh time, along with The Duck Inn and Han 202. The Duck Inn is known for its duck fat dog and five-course tasting menu. The Duck Inn has a varied menu with foie gras, escargot, and Spanish octopus for the adventurous eaters, and standard bar eats for the traditionalists. Han 202 is a BYOB modern Asian restaurant with a four-course prix-fixe menu. There are other standbys in Bridgeport, like Ricobene’s, Phil’s Pizza, Connie’s Pizza, and Freddie’s. Embracing the Italian side of the neighborhood, these are go-to spots for pizza, sandwiches, and, of course, Italian beef and sausage. The Bridgeport community is growing and thriving, but really, it always has been. The newcomers venturing into this neighborhood may find more agreeable prices, bigger spaces, and a quieter lifestyle.